Our young heroes find themselves in a land not seen in the DC Universe in sometime: Gemworld. 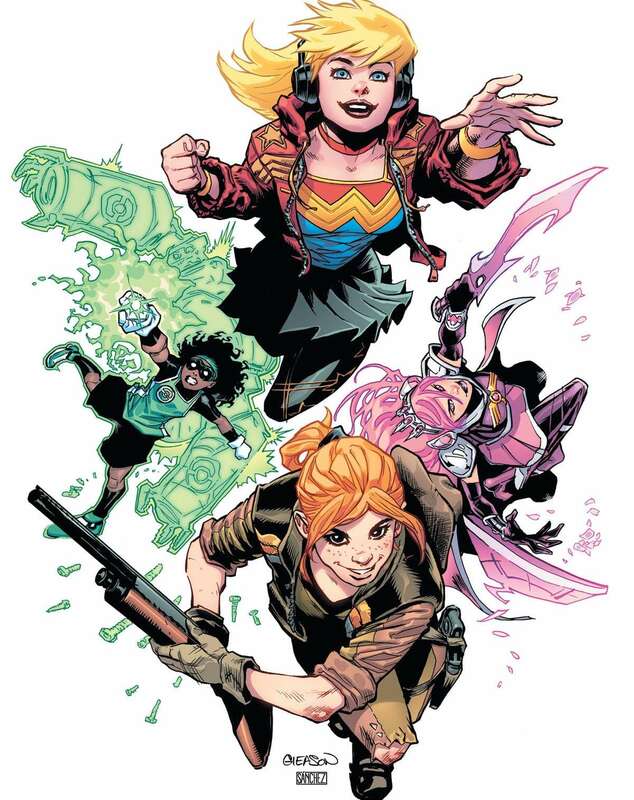 As Wondergirl, Teen Lantern and Jinny Hex familiarize begin to familiarize themselves with their surroundings and each other, the Twelve Royal Houses reach a decision that could change the fate of Gemworld forever. Plus, a look into what Wondergirl has been up to lately. Wonder. Its a powerful and mysterious emotion that people rarely talk about, and one that we should talk about more. People compare it to surprise, and often describe wonder as a combination of surprise and joy, but there is something more. Wonder brings something indescribable, intangible, and transcendent. I inspires passion, curiosity, and ambition. Young Justice leads the charge in an imprint of comics that aim to capture this elusive feeling, and the big question is, Does Young Justice #2 capture the feeling of wonder? Upon picking up the book, the first thing readers will notice is one of two covers. Both radiate a youthful innocence that few comics can pull off. Personally, I am not a fan of either cover’s art style, but I can recognize that talent that is put into them and the energies that both give off. It’ll put a smile on your face before you even open the book. The very first page, however, contains the bleak landscape known as Gemworld. If you were picturing a fantastical, colorful, and magical land of wonder, you may be disappointed with the dark shadows cast by jagged geological formations, and a dark atmosphere despite gems growing like plants. Most of the Royal House leaders meet like any shady cabal does: around an isolated campfire under the cloak of night. I appreciate that each Royal House featured is given their own unique look and personality. Gleason and Lupacchino may be drawing upon the past here, but he did a great job bringing Gemworld to a new generation of readers. I also commend Alejandro Sanchez for his color work. I respect artists and colorists who can draw a lot of meaning through the use of black and darkness, and Sanchez does a great job of bringing out the shadiness and secrecy through the shadow-work in the first few pages. The following scene in the Forests of Topaz provides a masterful depiction on the use of perspective. In three panels the reader can empathize with the absolutely crazy day Jinny Hex has had up to this moment, laugh as she realizes something odd and large is behind her, and then marvel at the realization that Jinny and Teen Lantern are completely and utterly lost. Teen Lantern’s construction is perhaps the best thing about this issue. It is a preeminent display in visual characterization and is simple but completely original. Gleason and Lupacchino do great work showing us this robotic construction from every angle as Jinny Hex inspects it, and one just can’t help but laugh. The glimpse of what Cassie has been up to is really nice, especially from fans of the character. It’s a great change of pace in the middle of the book with a bright blue sky and inks from Ray McCarthy that are a ray of sunshine in this book. A ray of sunshine is Cassie’s character in a nutshell, and that shines through in this flashback, but not before revealing a few other important characteristics about this new Cassie Sandsmark as well. As we return to Gemworld, we see characters collide as Amethyst and Robin join the gang. The team is full of snarky sarcasm and witty banter between Jinny Hex, Teen Lantern, and Robin alone, so humor will not be scarce in this series. This cast of characters is going to have some fun together, and I encourage going along for the ride. Wondergirl’s chemistry with the other members of the team seems a bit off in this issue. Her dialogue doesn’t quite hold its own with Jinny and Tenn Lantern’s witty sarcasm, and that leads to some issues regarding the presence the character projects. Cassie is one of the most experienced members of the team and makes an excellent grounding rod for a team that could easily turn into chaos. The problem is that the amount of questions she asks in this issue diminishes some of the authority she needs to have to serve that role. The strong, independent, grounded Cassie who knows who she is appears loud and clear during the flashback scene with Zeus, but remains largely absent during the Gemworld scenes. This presents a problem for both parts of the story because the flashback appears a tad too long as a result of these two different depictions of Cassie clashing. In this instance, Bendis’s knack for decompression does not do him any favors, and it causes the reader to be confused about how to perceive Wondergirl. Despite some characterization issues, Young Justice #2 is full of intrigue, touching character moments, and witty humor. Pick this one up soon, or you’ll be wondering why you didn’t sooner.